How are evidence and reasoning similar and different? Teachers will understand the different and overlapping roles evidence and reasoning play in supporting a claim. Teachers will be able to define evidence and reasoning. Teachers will be able to identify how students are using evidence and reasoning in oral and written arguments. *Extension- Try it with your students! Watch a segment (0:00-2:30) of a small group discussion considering student use of evidence and reasoning in the video below. What evidence do students use in their discussion? How do students use this evidence? How did you identify evidence in the previous activity? How would you define evidence? How did you identify reasoning in the previous activity? How would you define reasoning? Define evidence and reasoning. ​Emphasize that both can be challenging for students and they will need support incorporating evidence and reasoning into their arguments. Highlight both are a justification for a claim. The distinction provides a framework that is helpful but can be difficult to distinguish in practice​. Evidence is information about the natural world that is used to support a claim. In a scientific argument, evidence often consists of data, which can be measurements and observations. The quality of the evidence supporting a claim can be more important than the quantity. Quality of evidence depends on a variety of factors, including reliability of the source and reproducibility. ​Reasoning is the process of making clear how your evidence supports your claim. In scientific argumentation, clear reasoning can include using scientific ideas or principles to make logical connections between evidence and a claim. The overall quality of an argument is dependent on having strong evidence and clear reasoning. Read each of the 4 student arguments on the Sample Student Argument handout. Working in pairs or small groups, respond to the discussion questions. What challenges did you face in identifying student reasoning? Earthquakes travel through the Earth in waves. The waves begin at the focus, which is where the earthquake starts underground. The epicenter is directly above the focus on the Earth’s surface. 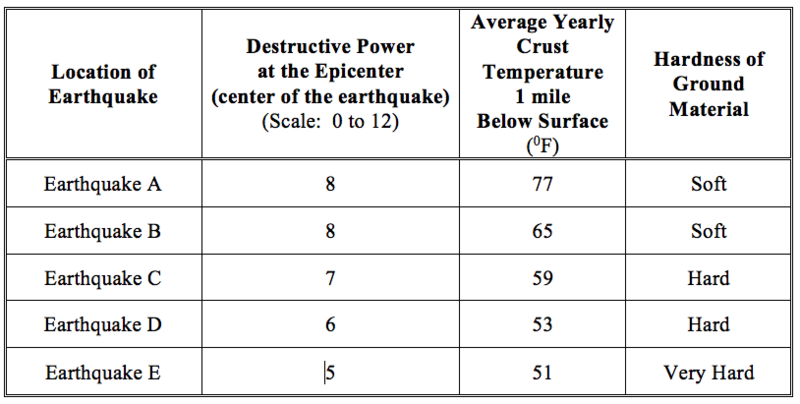 More powerful earthquakes happen when the focus of the earthquake occurs in soft ground material, because the earthquake waves can travel more easily through soft ground. Data table provided to students. Evidence and reasoning are both part of the justification for a claim. There’s not always a clear distinction between evidence and reasoning, but the important thing to focus on is the role they both play in supporting a claim. Reasoning is the process of making clear how your evidence supports your claim. Clear reasoning can include using scientific ideas or principles to make logical connections between evidence and a claim. Ask your students to write an argument using evidence and reasoning. For the next meeting, share an example, and identify the evidence and reasoning students used. Prepare to discuss the challenges you encountered in identifying and distinguishing between evidence and reasoning in student written arguments.